Heat 1 Tb. olive oil in a large saute pan over medium heat and add onion. Cook until translucent. Add mushrooms, thyme, and garlic to the onions and cook for 5 minutes. Sprinkle mushrooms with a pinch of salt and pepper and then 1 tsp of truffle oil, cook for 1 minute then transfer to a medium sized bow;. Cover with aluminum foil to keep warm. In the saute pan you were just using add 1 Tb olive oil and arborio rice. Stir the entire time and cook for 1 minute. Add white wine to rice and allow to almost completely evaporate. Stir occasionally. Add 1 Cup of chicken stock to rice at a time, allowing each cup to nearly evaporate before the next cup is added. Stir occasionally. 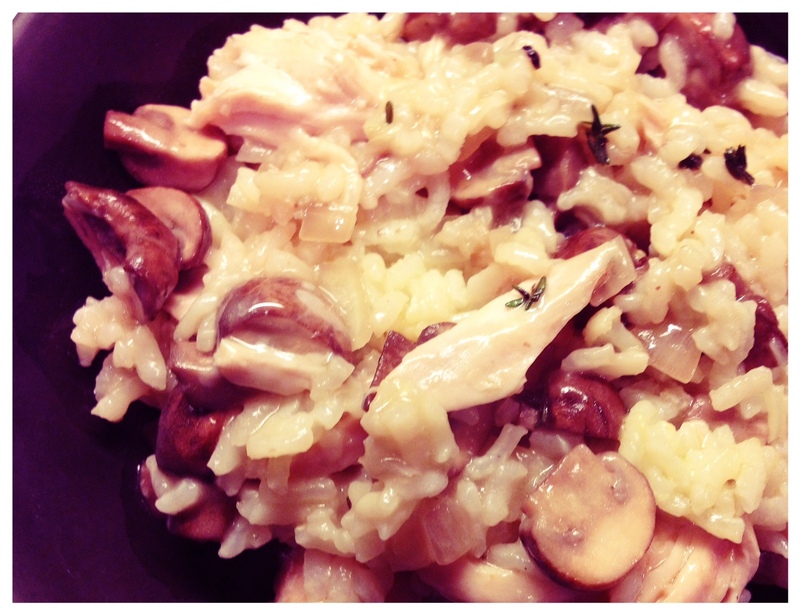 Once risotto is soft yet still chewy add mushroom mixture back to saute pan, in addition to parmesan cheese and remaining truffle oil. Toss in chicken and then serve immediately. do you just add the chicken at the end?? ?